Communal worker at London, England; born Sept. 19, 1816; died Nov. 5, 1896. She was the second daughter of Sir Isaac Lyon and Isabel Goldsmid, and was privately educated by some of the most eminent teachers of the time, including Thomas Campbell, the poet. 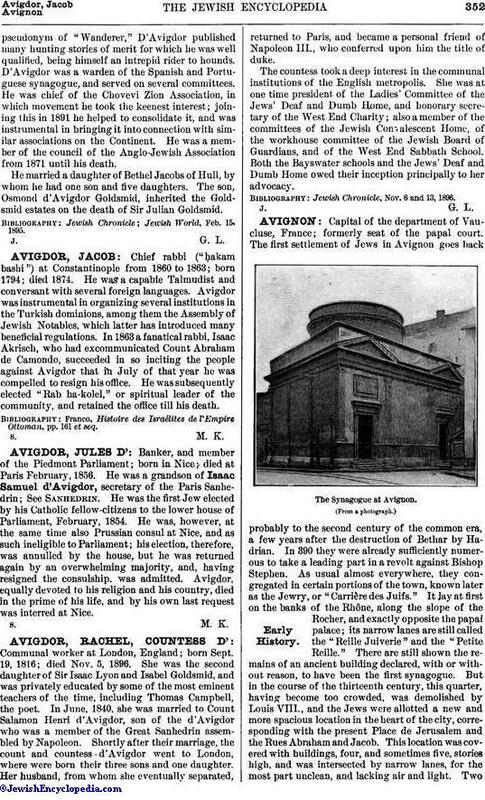 In June, 1840, she was married to Count Salamon Henri d'Avigdor, son of the d'Avigdor who was a member of the Great Sanhedrin assembled by Napoleon. Shortly after their marriage, the count and countess d'Avigdor went to London, where were born their three sons and one daughter. Her husband, from whom she eventually separated, returned to Paris, and became a personal friend of Napoleon III., who conferred upon him the title of duke. The countess took a deep interest in the communal institutions of the English metropolis. She was at one time president of the Ladies' Committee of the Jews' Deaf and Dumb Home, and honorary secretary of the West End Charity; also a member of the committees of the Jewish Convalescent Home, of the workhouse committee of the Jewish Board of Guardians, and of the West End Sabbath School. Both the Bayswater schools and the Jews' Deaf and Dumb Home owed their inception principally to her advocacy. Jewish Chronicle, Nov. 6 and 13, 1896.